This article is based on pages 133 – 152 of Paul Davies `s book Eerie Silence. The extract builds upon the third law of Arthur C. Clarke, that “Any sufficiently advanced technology is indistinguishable from magic.” It discusses the principle for SETI artifact searches. There are various structures / particles postulated by the fundamental theories of physics which have not been observed experimentally. Few of the examples cited in the passage are magnetic monopoles, dark matter particle and cosmic string. 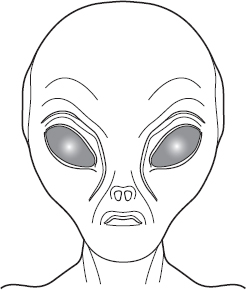 An example given is that the paucity of these could be due to exploitation of this structures / particles by a hyper – advanced ET civilization for energy production. Moving on from here, the author builds on the ‘nature plus’ theme for ET. Basically how ET could manifest itself as the next step after nature and thus not stand out obviously like a sore thumb, but as an extension of the abilities and phenomenon seen naturally. He gives the example of a scenario from Roger Penrose about dumping waste into a black hole to harness its rotational kinetic energy. Another important point made is that it is quite possible, perhaps even likely that ET manifests itself in a manner unfathomable to us. The example given is of lasers. For someone from a few centuries ago, lasers would not seem like a man – made thing and would seem like a weird (then inexplicable) naturally occurring phenomenon. On a similar note, potential ET technology could be right in our face but its artificial origins undetectable to us. The last thing he covers is how the ‘laws of Physics’, which in theory are set in stone, are not really. They are only sacrosanct as far our current measurement capabilities are concerned. For example, ether was accepted till Michelson – Morley proved it otherwise. Newtonian gravity was good enough till observations began diverging from it and could no longer be explained by simple theory. Therefore the laws of Physics which we let govern us in our search for ET, might fundamentally be incomplete. I think the point of this article is not to cast a gloomy note over our search for ET, but just to say that we do not know what we don’t know. Our knowledge and understanding of the ‘known’ Universe is severely lacking. Therefore, 1) we should not consider our search for ET exhaustive even if we plough through a major portion of the cosmic haystack unsuccessfully; 2) always be open to and on the watch for anomalies in observational data (similar to the point made in GHat 4). SETI [is] an interdisciplinary study that includes the humanities and social sciences, and a subfield of astrobiology that focuses on the detection of technosignatures (as opposed to biosignatures). Two major branches of SETI are communication SETI and artifact SETI (although the line between them is not always sharp), and others include METI and the search for “nature plus”. Above is a comparison of “orthodox” SETI and “Dysonian” SETI. Wright argues that SETI as a whole is in between both of these extremes. The fact that each extreme focuses at difference frequencies and has different assumptions of advanced technological civilizations (ATC) suggests multi-discipline approach. The table is from Bradbury et. al. 2011. For Bradbury, to focus on just radio SETI lacks scientific merit and appears to be done out of deference to the founders of SETI. Instead, both orthodox and Dysonian SETI should be viewed as one field requiring knowledge from various other subfields. Wright builds upon Bradbury’s conclusion by attempting to show that SETI is interdisciplinary. He notes that SETI can be performed at multiple wavelengths, such as the optical and near infrared. A lot of the examples provided; exoplanetary science, galactic and stellar astrophysics, time-domain astronomy, and multi-messenger astronomy easily make SETI part of physics and astrophysics. The case for interdisciplinarity becomes more concrete for the social sciences. Wright appears to argue for the need of xenology, using humanity as a logical stepping stone. This is a reasonable step and, while social sciences will inherently carry an anthropocentric view, it does allow for interesting dialogue with social scientists and practitioners of SETI. Wright argues that for SETI to embrace multiple disciplines, it must standardize the jargon used by practitioners. While some of the terms he mentions are obscure (alien race), others such as “intelligence” and “beacon” have clear implications in what SETI is searching for and how to proceed. This blogger is largely in agreement with Wright. It makes no sense for SETI to be fragmented into many factions as they are all doing something to search for extraterrestrial life. Normalizing the language used is but one step. As mentioned by Bradbury, there still exists some stigma towards Dysonian SETI which hopefully disappears as more searches are performed. In this post I shall discuss the white paper written by Jason Wright on the need for SETI to adopt standard terminology. The paper argues about the need for such an approach. 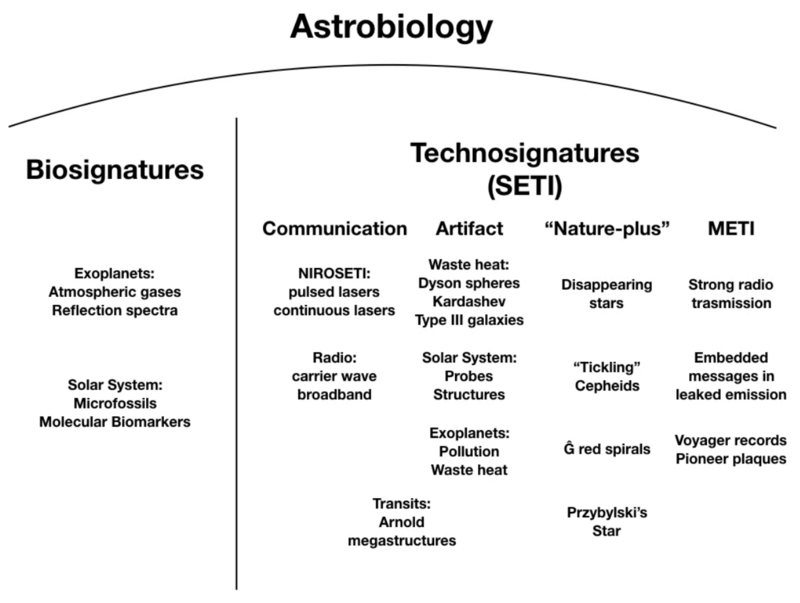 In the era of advances in astrobiology, we need to find the right synergy between the two fields, and how SETI is rightfully a subset of astrobiology since it is also looking for signatures of life (biology) around celestial bodies. The field of exoplanets has rapidly grown since the first discovery of an exoplanet around a star in 1995 [51 Pegasi b]. With advances in engineering and instrumentation we are slowly approaching the domain where we can detect the presence of an Earth like planet around a Sun like star in its habitable zone [Kasting 1991]. In tandem with this process of discovery, the characterization of exoplanetary atmosphere and climate has also progressed using spectroscopy techniques; attempts have been made to detect biosignatures in these spectra of exoplanets. Closer home, we also have ‘potentially’ habitable objects, which could have harboured life in the past, or might have life in the present as well. Solar system bodies like Europa, Enceladus and Mars, are intriguing objects which might have the right conditions to sustain (or have sustained) life. Astrobiology is generally touted to be limited to this search for biosignatures. However, as mentioned in the introduction, it must include not only biosignatures, but also technosignatures or signs of intelligent (advanced technologically) life. A unified jargon is important in a diverse and interdisciplinary field like SETI which involves contributions and discourse from not only astronomers, but also engineers, anthropologists, linguists, and potentially cryptologists. The paper by cites the example of Artifact SETI, and how it should be an umbrella term for various kinds of searches. An example of this that I have encountered (a situation nowhere as close to as significant as in SETI, however representative nonetheless), is when I tried to understand radio astronomer jargon in order to derive the relation between transmitter bandwidth and the sensitivity of a receiver. Being involved with optical and NIR astronomy, I am completely alien to radio astronomy. Despite both the fields being subsets of astronomy and governed by the same laws of Physics, there exist a large number of differences in how they measure and quantify similar parameters. It would have been very useful if they used the same terminology or in the least had some kind of a guide to bridge the two. Now, if we take this situation and extrapolate it to collaborations between the sciences and humanities, this problem gets severely exacerbated. Hence, I think the framework adopted by this paper is necessary, and one that should be worked on as the field of SETI grows and involves collaborations from other fields and subjects. I have a pet peeve about concreteness. I have been to a few conferences now, and an overarching theme I’ve noticed is that someone will have a fascinating concept, but be kind of dodgy when asked about how to directly apply their concept to real methodology. As an example, the idea of “ecoscenography” was proposed at an art + science + education conference I attended a few years back. The thesis is that theatrical performances can be extremely wasteful – sets are constructed, used once, and then discarded, and the entire process is disproportionately and unnecessarily harmful to the environment. I was involved in theatre for a long time, and was really interested, so I talked to the speaker about implementation (Reusing simple set elements by repainting? Using more recycled materials? A sharing program between schools for costumes/props/set pieces? ), and they kept insisting that we should keep it broad, it’s more of a philosophy, and not define any specific techniques. Well, to be frank, that sounds like a great way for your idea never to be of any use to anyone. We shouldn’t worry about offending / being politically correct to a species we haven’t met yet, that we may never discover the existence of! Here’s my response to those arguments, after a few weeks of on and off pondering. This is not a paper about political correctness, either in its favour or against it. This is a paper that argues that the lack of precise and accurate terminology hinders the logistical workings of and the intellectual vibrancy/creativity of SETI more than in other fields, and we should recognize and take steps to fix that. If I were as general as the talks that I berated for lack of concreteness in the earlier part of this post, I would leave it at that. But because I’m not, I want to take on this particular example. Habitable worlds ripe for the picking… or not? The point of these questions isn’t that any particular suggestion I made is a good idea. A lot of them are not, or violate other fallacies (like the monocultural fallacy, for example). But it’s obvious that if we look closely at the relatively straightforward logical steps that follow from the dictionary definition of “colonization”, all sorts of SETI search strategies end up being implicitly excluded or assumed. Are we self-aware enough to say “well, I know what the word implies, but I wouldn’t let that affect my science in such obvious, drastic ways” and succeed in that quest? I don’t know about anyone else, but I don’t think I’m self-aware enough for that. I’m sure there are some assumptions hidden in here that I’ve missed. I am, after all, only human! So in your next publication, dear reader, please use the word “settlement” instead of “colonization”. Your science will thank you. To add an additional complication at the end of this blog post: I discovered that in biology, colonisation or colonization means “a process by which a species spreads to new areas”. This definition has the perfect lack of connotations that we’re looking for in SETI, and would be a strong argument to continue using the word. My response: SETI is a subset of astrobiology, so we will be interacting with people who DO use this definition. Most practitioners, however, will still have the historical connotations in their head (because that’s what we’ve been exposed to, socially, and humans aren’t very good at putting that sort of conditioning out of our heads). To get around this confusion, in SETI, we should take “settlement” to have the definition I posit at the top of the page. How immutable are our social media consumption habits? Very few people would argue that immutable and social media should even be in the same sentence, except perhaps in that electronic paper trail that we leave behind us (“once it’s out on the internet you can never take it back!”). Vine, YikYak, and MySpace are just a few of the corpses that litter the social media platform floor. With all of this in mind, #FoundThem, Duncan Forgan and Alexander Scholz’s paper about having SETI announcements keep pace with modern news consumption habits, is at once necessary and illuminating and simultaneously overly optimistic and prey to its own criticisms. The authors consider the very important problem of public outreach and media image at a depth that most SETI scientists probably don’t think about. 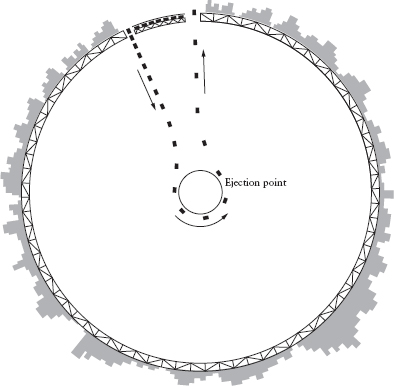 They argue that being aware of SETI’s perception in the media and taking active steps to prevent misunderstandings, preempt leaks, combat misreporting, and discourage sensationalism are a fundamental part of doing SETI science, and that proper protocols should be established and followed in this vein. It’s hard to argue with the sense in that! But the execution of the idea would certainly be hard to pull off. Convincing scientists to coherently and publicly write about their methods before a search is even conducted seems whimsical at best. Old habits die hard, and changing the career habits of a generation of scientists is probably impossible. There’s an overriding fear of being scooped (see the 2003 EL61 incident) that makes some scientists wary of public information. And then there’s just the natural non-linearity that comes from being scatterbrained and/or busy and/or having organically evolving projects. The authors argue that news is changing and that social media platforms will come and go. They give examples of Twitter, YouTube and Vimeo in their final section summarizing their proposed protocols. There are so many questions that this raises for me. The authors admit that the platforms are changing, but implicitly assume that, more generally, video publishing, “microblogging”, and medium to long form blogs will maintain popularity. I don’t have a good sense for how good an assumption that is, but perhaps they should’ve kept their suggestions more general, such that their paper will be relevant for longer. In addition, the form of the content is not well discussed. Should these platforms be utilized to leave a publicly accessible research blog, polished and written for a general audience? Or just research notes, to leave a nice trail of proof but without the humor and shine* that you might include in a piece that’s actually meant to get “likes” and “retweets” and “views” and “shares”? Or just a video of a scientist at a desk, reciting the day’s progress in a jargon-y monotone? All of them require additional time which will not be spent doing science, some far more than others. Suggesting that the journalists clean up their act instead seems disingenuous – like shifting the burden because we SETI practitioners don’t want to deal with it. At the same time, however, I feel like the most meticulously kept blog will fall like a domino in front of a single determined journalist with a sensationalist pen. Raise your hand if you’ve seen the Rio Scale used in an article (or even heard of the Rio Scale). My point exactly. Even if we could be as careful and involved with outreach as the authors suggest, the root of the problem might be deeper than a familiarity with WordPress can cure. *some authors are probably incapable of humor and shine – what should they do in this case? I am very critical of yellow journalism, especially when it comes to the topic of the burgeoning search for extraterrestrial intelligence. It seems that in order to draw more traffic to their domains, journalists are often incentivized to throw in more buzzwords or sensational misrepresentations of the primary message of their interviewees. In this department, Andersen’s article in The Atlantic fares moderately well in that he does not go headlong into sensation (though he does participate to some degree, as we shall see). The article provides decent exposition on the astronomical techniques used in the detection of exoplanets and an account of the events regarding Tabby’s star as they unfolded. My primary qualm with the presentation was that they emboldened and enlarged a paraphrase of a quote from Prof. Jason Wright, which seemed to distract from his main message (My secondary qualm is that in their last sentence they suggeste that Tabby’s star might see Earth transit, but the declination of Kepler field stars places them well beyond the range of the Earth transit zone). In the paragraph text, he says: “Aliens should always be the very last hypothesis you consider.” This is what most certainly, if any, should have been emboldened and enlarged. Instead they chose: “… it looked like [something] you might expect an alien civilization to build.” To the lay person who might only read the article in brief and without skeptically-trained eyes, they may come across this latter phrase and then go on to tell all their friends and family a false truth regarding Tabby’s Star due to this choice of emphasis. This is obviously dangerous to the representation of SETI and astronomy in general, and may tarnish the reputation of the field and the authors consulted. I would strongly admonish any deviation from a purely accurate representation of the ideas and phrases of a scientist, especially so in this area. Therefore, it is the role of the scientist to effectively explain the subtlety of their position to the journalist and the role of the journalist to reflect such a position with fidelity in the popular article.